How much does it cost to travel to Honduras? How much money will you need in Honduras? L705 ($29) is the average daily price for traveling in Honduras. The average price of food for one day is L180 ($7.35). The average price of a hotel for a couple is L312 ($13). Additional pricing is in the table below. These average travel prices have been collected from other travelers to help you plan your own travel budget. How much money do I need for Honduras? Honduras is the second largest country in Central America and offers visitors far more diversity than many realize. It has colonial villages, ancient Maya ruins, natural parks, and the Bay Islands. It has a coastline on both the Pacific and Caribbean sides and is a popular destination for scuba diving and snorkeling. In the larger cities such as Tegucigalpa, San Pedro Sula, La Ceiba, Tela, and elsewhere you will find good amenities for tourists, but if you travel to the more rural and less frequented areas you will find basic accommodation and limited facilities. A little bit of money can go a long way in Honduras. Prices are generally quite low, and if you're willing to pay slightly more you will find the quality of the hotel increases dramatically. Honduras can be divided roughly into three areas. Caribbean Honduras offers the most beaches and port towns as well as the offshore islands and lowland jungle. The Honduran Highlands include the capital city as well as many of the Mayan ruins, mountains, and the old Spanish colonial hill towns. Pacific Honduras is the smallest region and includes the major Pacific ocean ports. In recent years cruise lines have begun traveling to the Caribbean side of Honduras. With the cruise ships have come an influx of tourists and major infrastructure development. The dynamic and atmosphere of the islands have changed, but the diving and snorkeling remains superb. Outside of the coastal ports you'll find areas that remain untouched by these developments, but the coastline continues to rapidly evolve and change. The inland areas in Honduras are mountainous while the coastal areas are generally flat. There is a short coastline along the Pacific side of the country but the Caribbean coastline is quite long. The temperature remains hot and humid throughout the entire year. You'll find the coolest temperatures in the higher elevations while the Caribbean coast gets frequent showers, particularly between the months of September and February. Spanish is the primary language that is spoken in Honduras. You will find some people who speak English in the larger cities, but once you are in the more rural areas you're unlikely to find many English speakers. Those who work in the tourist industry generally speak some English as well. Local handicrafts are popular souvenir options with tourists. The country is known for its Lenca ceramics, but there are also a variety of other cheap items available such as hand carved wooden boxes, hammocks, paintings, leather products, and hand woven fabrics. Some items come from neighboring countries, so if you're specifically looking for items made in Honduras be sure and inquire about the origin of the product. If you're spending time in San Pedro Sula, make sure you take a trip to El Mercado Guamilito where you'll find a wide selection of handicrafts at low prices. One of the most popular regions to visit in Honduras is along the Caribbean Coast. There you will find the Bay Islands including Utila, Roatan, and Guanaja. This is an excellent place for scuba diving and snorkeling. If you're not a certified diver there are plenty of schools available that offer reputable programs. Also consider doing some hiking, kayaking, or wildlife viewing while you're in the area. Many people travel to Honduras to participate in volunteer work. If you're participating in an organized volunteer program, make sure it is a reputable group that offers a genuine service to the people. Confirm where your money goes and ensure that you are not displacing local workers with your volunteer service. Copan Ruinas: These ruins once formed one of the great centers of Mayan civilization dating over a thousand years ago. 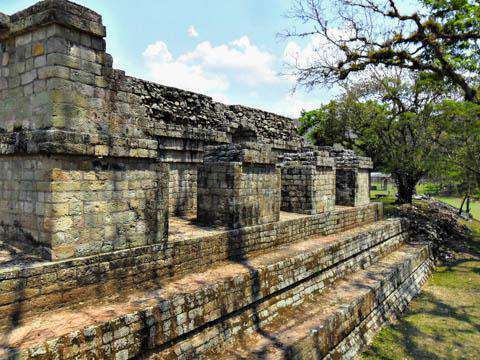 The ruins are found in western Honduras and are one of the country's major tourist attractions. There is a nearby town of the same name where you can find modern hotels and tourist facilities. Roatan: This is one of the Honduras Bay Islands which is found in the Caribbean Sea. It's conveniently located near one of the largest barrier reefs in the world, second only to the Great Barrier Reef in Australia. It remained a hidden gem for many years but has recently become a port of call for cruise ships. It's a popular scuba diving and snorkeling destination for many visitors. Musuem of Anthropology and History: If you have a day or two in San Pedro Sula consider heading to this museum. It has a wide variety of items on display including pre-Columbian pottery, grinders, and more. Food in Honduras is a blend of African, Spanish, and indigenous flavors. It makes use of coconut more than many of the neighboring countries. You'll also find many different seafood dishes around the Bay Islands. Plato Tipico: This is the most popular dish in Honduras and is commonly prepared for lunch. It includes rice, beef, fried beans and fried bananas and is sometimes served with chimol which is a fresh salsa that is made from tomatoes, green peppers, onions, cilantro and lime juice. Baleadas: This dish includes a flour tortilla that is filled with refried beans, cheese, and a cream that is similar to sour cream. It sometimes includes an egg, avocado, or meat in the filling as well. Enchiladas: Honduran enchiladas are different from those found in Mexico. The are made with flat tortillas that are fried and topped with beef, cheese and sauce.